I guess you could say that I'm on a quiet mission to reduce the amount of plastic that touches my food. Since moving back to America, I've begun primarily cooking on iron cookware, storing leftovers in glass or ceramic containers, and replaced all of my plastic cooking utensils with wooden ones. There have been two things, however, that I've been holding back on doing without because I just couldn't figure out a good alternative: ziplock baggies and cling wrap. I've thought about using aluminum foil, but the few times that I'd tried it before, I usually wound up forgetting what was in there until it was too late. 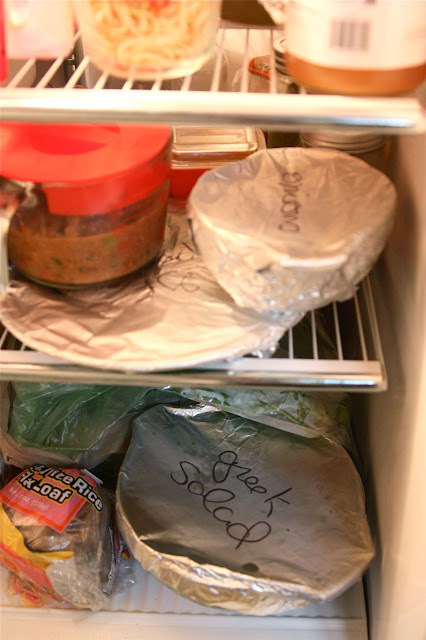 Putting food in the fridge the other day, and pondering this dilemma again, I suddenly thought about ordering a Joey Bag of Doughnuts at my favorite burrito joint and got the idea to label what's under the foil with a permanent marker! Do you worry about plastic and your food? I think this is a great solution for refrigerator storage, but I'm still using ziplock baggies occasionally for other things, like taking snacks to-go. What do you use? Got any tips for me? Let me know, and if I love your tip, I might feature it here for all of us to enjoy! We keep a roll of masking tape and a sharpie in the junk drawer by the fridge. We label everything that goes in the fridge with what it is and the date it was made so if we find the "mystery meat" three weeks later we know how old it is.